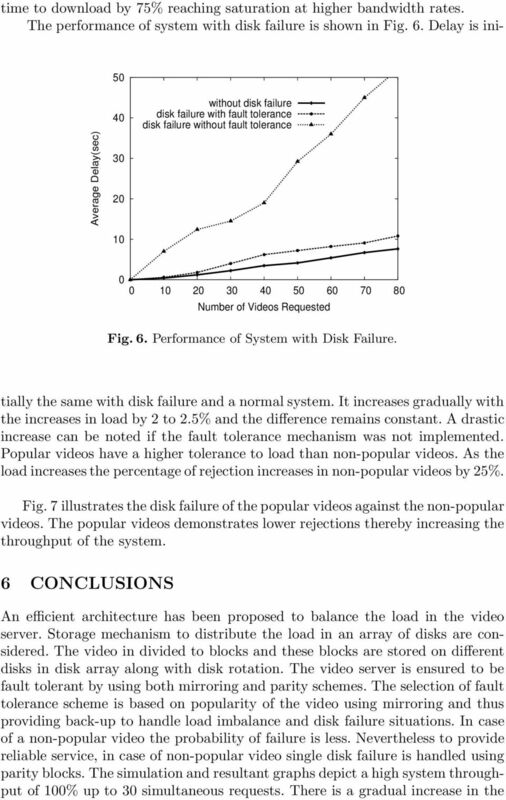 Download "Load Balancing in Fault Tolerant Video Server"
3 a video server may be characterized by popularity of the video. 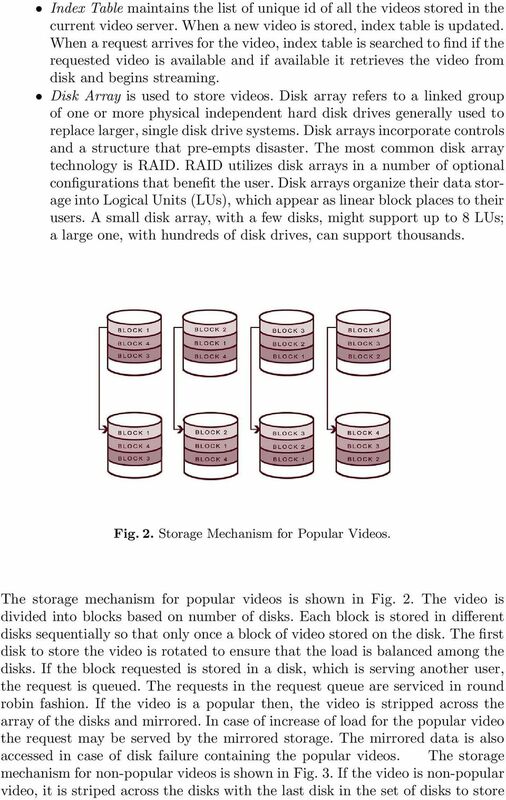 Replication of videos and placement of video blocks based on popularity is discussed in ,  and explores a data placement method based on rate staggering to store scalable video data in a disk-array based video server. 3 SYSTEM ARCHITECTURE The storage scheme designed, evaluates the popularity of the video before it is stored. The video storage differs with popularity. If the video is popular, then it is striped across array of disks and mirrored else it is striped across the disks with the last disk in the set of disks to store the parity information. This helps to rebuild the video block in case of disk failure. The overview of the architecture is shown in Fig. 1. Fig. 1. Overview of the Architecture Request Dispatcher is a controller that is required at the user side to take the user s command and send the signal to the server through its network interface. The request dispatcher also stores video signals it receives from the server into its buffer, decodes the compressed signals and sends the decoded signals to the display at the appropriate time. Buffer is the video memory that holds the video image to be displayed on the screen of the user. The amount of memory required to hold the image depends primarily on the resolution of the image and also the color depth used per pixel. Once the server locates the video and moves the video frame by frame to the user, the frames are first stored temporarily in the user s buffer before it is displayed to the user. The advantage of having a buffer in the user s memory is to reduce the jitter and to provide high quality video transmission to the users. 6 Table 1. Video Storage Video Storage (VideoId) determine the popularity of the video. if (video is popular) BlockSize = VideoSize / n else BlockSize = VideoSize / n-1 i=0 j =0 if ( space available to store video at BlockSize on disk j) until ( VideoSize 0) j = (( VideoId % n )+ i)% n reduce VideoSize by BlockSize. 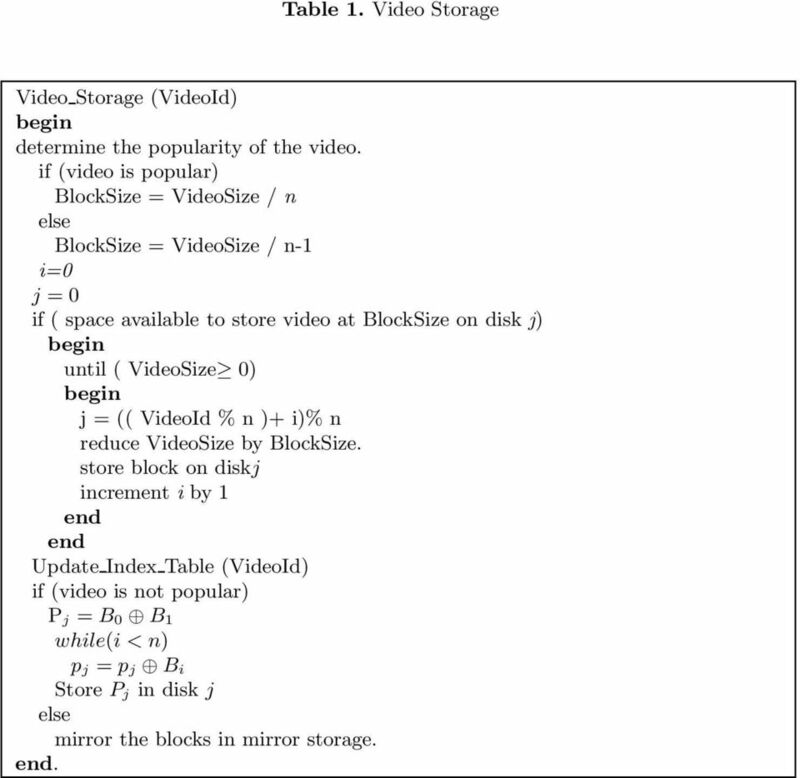 store block on diskj increment i by 1 end end Update Index Table (VideoId) if (video is not popular) P j = B 0 B 1 while(i <n) p j = p j B i Store P j in disk j else mirror the blocks in mirror storage. end. 8 12 Average Delay(ms) disks 10 disks 12 disks Load Fig. 4. Start-up delay. 100 Average time to download(sec) Load-20 Load-40 Load Bandwidth(Mbps) Fig. 5. Bandwidth Utilization for Varying Load..
Keywords Load balancing, Dispatcher, Distributed Cluster Server, Static Load balancing, Dynamic Load balancing. 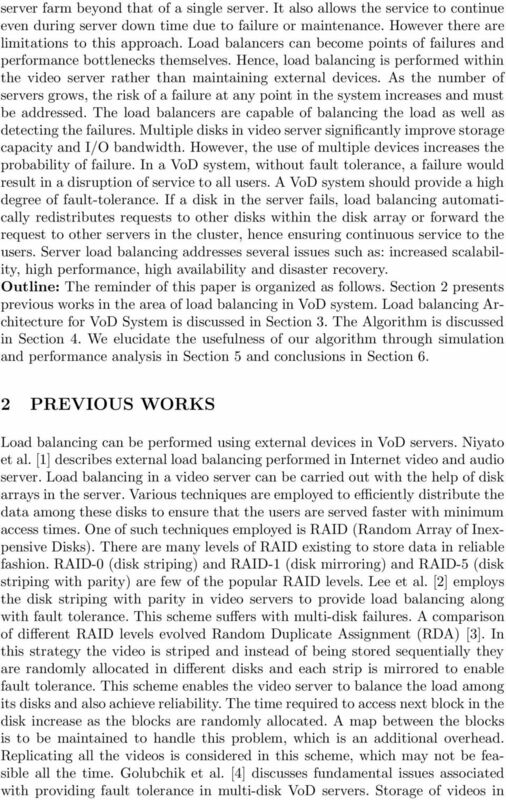 International Journal of Grid and Distributed Computing 63 A Load Balanced PC-Cluster for Video-On-Demand Server Systems Liang-Teh Lee 1, Hung-Yuan Chang 1,2, Der-Fu Tao 2, and Siang-Lin Yang 1 1 Dept.